Color-enriched bleach formula clings to surface and stays in place for a visible easy clean. Great for removing tough stains and controlling odor on hard nonporous surfaces. 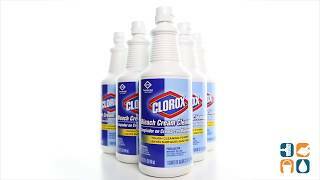 Clorox Bleach Cream Cleanser contains innovative scrubbing beads that penetrates dirt quickly making cleaning fast and efficient. 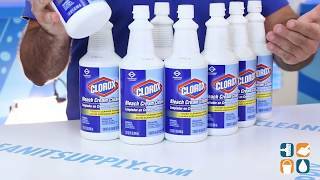 Clorox bleach cleaner rinses off quickly and leaves surface sanitary and shiny. Application: Bathrooms; Laundry; Applicable Material: Ceramic; Cloth; Concrete; Fabric; Chemical Compound: Bleach. Great for cleaning bathrooms, grout, and so much more. Recommended for tough stains.